We normally think of urban screens as those larger (and brighter) than life media displays that illuminate cities and public spaces throughout the world. In places like Shibuya or Times Square, for example, building façades have become the sites for what Scott McQuire, Meredith Martin, and Sabine Niederer call the "spectacular exhaustion of urban space." The term serves a double purpose. On the one hand, it does allude, albeit subtly, to the idea of how media screens become sources of light pollution. The suggestion is that urban screens, with their barrage of lights, exhaust and confuse the urban dweller to the point of sensorial exhaustion. 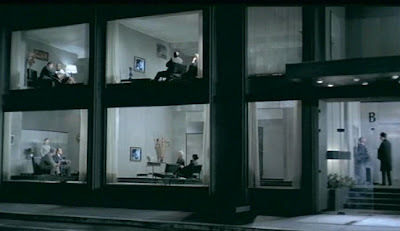 On the other hand, the term operates as a nod to Guy Debord's Society of the Spectacle (1967) as well as to Paul Virilio's idea of architecture as "media building"—the latter being a term describing how architecture has transformed from a practice of creating structures of habitation to designing vehicles of information. Such language immediately invokes buildings like Toyo Ito's Sendai Mediatheque (2001). Ito's statement that his building—a Maison Dom-i-no for the information age integrating “the primitive body of natural flow and the virtual body of electronic flow”—really does invoke architecture as the literal building of media. Historical analyses are useful in detecting the social, cultural, and technological milieus that led to the deployment of urban screens. However, what kind of history are we (or should we be) talking about? 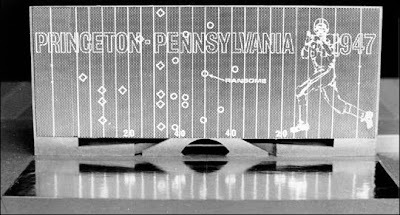 In his contribution to the Urban Screens Reader (2009), Erkki Huhtamo outlines an "archaeology of public media displays"—an ostensibly foucauldian approach that looks at past practices in order to understand the present. He links contemporary urban screen practice to the development of "trade signs, banners and broadsides to billboards and the earliest dynamic displays" of the 19th and 20th centuries. Huhtamo's essay asserts that urban screen practice is first and formost urban—and from this we can infer that urban screens are therefore coextensive with the development of modern urbanism. Such an assumption would normally cause us to deploy our favorite quotes and aphorisms by Walter Benjamin, Georg Simmel, or Siegfried Kracauer in support of Huhtamo's observations at a moment's notice. And yet somehow the history of architecture remains a muted presence. [T]he television screen can be said to live up to its name in at least three distinct, contradictory and yet interrelated senses. First, it serves as a screen which allows distant vision [tele-vision] to be watched. Second, it screens, in the sense of selecting or filtering, the vision that is watched. And finally, it serves as a screen in the sense of standing between the viewer and the viewed, since what is rendered visible covers the separation that distinguished the other vision [the seeing someone or something seeing] from that of the sight of the spectator sitting in front of the set. The same could be said, for the most part, about urban screens. Architectural effects, of course, have their own history, and Weber's framework can provide a solid foundation from which to understand this development. To modify this statement and apply it to urban screens as architecture requires some elaboration. The first two definitions of screen—of screen as a mediator of distant vision and as a kind of selective filter—certainly do apply to urban screens. Urban screens can depict scenes from faraway or physically distinct locales much in the same way as a television screen. The third definition, however, is a variant of the first. We can think of it as a way of distinguishing the sight of the viewer from the source of the image on the urban screen. It is an impure opticality (to modify Clement Greenberg's term)—an opticality that relies on the flatness of the urban screen (or just the condition of flatness) for its ability to project and transmit images. The idea of an impure opticality recognizes the urban screen as a hybrid site that can include and display various kinds of media at different times. Uncanny. The contours of the building are erased. But in one’s consciousness they still rise, chase one another, trample one another. This is the foil for the flaming scripts, the rocket fire of moving illuminating ads, emerging and submerging, disappearing and breaking out again over the thousands of autos and the maelstrom of pleasureseeking people. Still disordered, because exaggerated, but all the same full of imaginative beauty, which will one day be complete. Lang's photograph and Mendelsohn's caption are a useful starting point for our investigation of urban screens for two reasons. First, notice how the photograph elides any distinction between building and media. This arresting image owes as much to its exposure as it does to the phantom traces captured on film. But it is also important to note just how critical Mendelsohn is of the resulting image. The casting of lights onto urban space is "beautiful" yet "disordered." Like the attendant image, his observations collapse any difference between building and billboard—we get the sense that he directs his ire as much to the billboard as to the underlying architecture, and yet it is difficult to maintain any difference between the two. 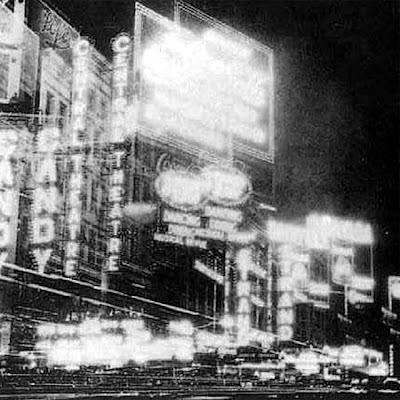 We can think of Lang's photograph as one of the first architectural conceptualizations of urban screens because of its equation of light effects with buildings. Although this was precisely the point of Mendelsohn's invective, other architects took advantage of this equivalency. 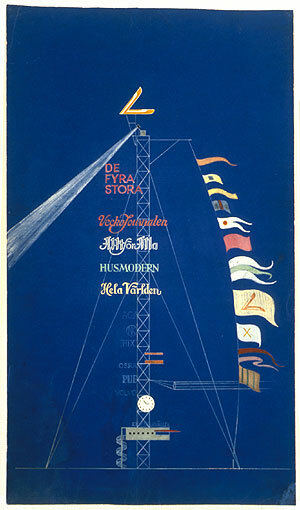 Only a couple of years later, Swedish architect Erik Gunnar Asplund (1885-1940) drew an elevation for an advertising mast for the Stockholm Exhibition of 1930. The drawing reveals only the most minimal of architectural interventions—a neo-Constructivist fantasy of sorts. A giant, metal frame, carried aloft above grade, acts a mast supporting a small observation platform between clew and tack. Steel battens extend outward, each holding a thin cable suggesting the existence of a sail. Between head and clew, and somewhere along the leech, nautical banners flutter in the wind. Along the luff, illuminated signs bearing the names and logos of various companies are stacked upon each other. Asplund's mast acted like a beacon, casting its incandescent information into the air. The Swedish novelist Ivar Lo-Johansson even remarked how "the high steel mast on the exhibition grounds projected like a signal, like a thrilling expression of joy, toward the bright blue sky. The era of functionalism had blown in." 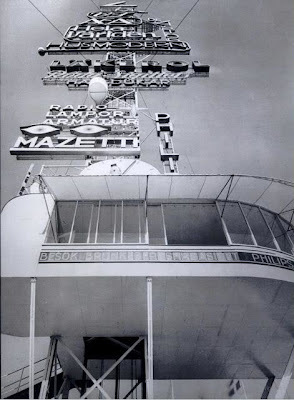 One of the most compelling and dramatic images of Asplund's advertising mast was taken from ground level by photographer C.G. Rosenberg. The camera, trained upwards, reveals the aforementioned stacking of corporate logos (designed by fellow Swedish architect Sigurd Lewerentz). Here, unlike in Lang's photograph, the logos never dominate or overpower the image. Lewerentz's signs occupy only the top half of the image. They almost totally obscure the mast. The observation platform dominates the bottom half of the image. This trick of angle does more than just compress the entirety of the advertisement mast into a single frame—it equates the relative flatness of the corporate logos with the flat, smooth, white surfaces of the observation deck. And yet, the building in the picture, though white and supported in the air, nevertheless appears heavy and overbearing. Here, through careful composition, architectural modernism literally and figuratively supports the projection of images into public space. Architecture becomes the foundation for the broadcasting of media. The building fronts on large parking spaces and Rutgers Stadium and backs onto an exhibition field. The billboard is 100' x 200'. Buttresses integrate it with the rest of the building. Interior display niches fall within the buttress, static spaces along a long gallery. This billboard, itself several feet thick, is backed by a maintenance catwalk, interlaced with the buttresses. The screen, the approximate proportions of a football field, is lit by 200,000 electronically programmed lights which produce moving sequences of naturalistic images, or words and diagrams of football plays. Immediately below the screen, where seats are bad in a movie, is a moat. What differentiates this project from Lang's photograph or Asplund's mast is an emphasis on entertainment. 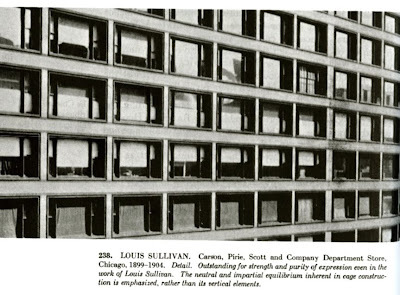 Venturi's description affirms the building's role as a provider of images for public consumption. 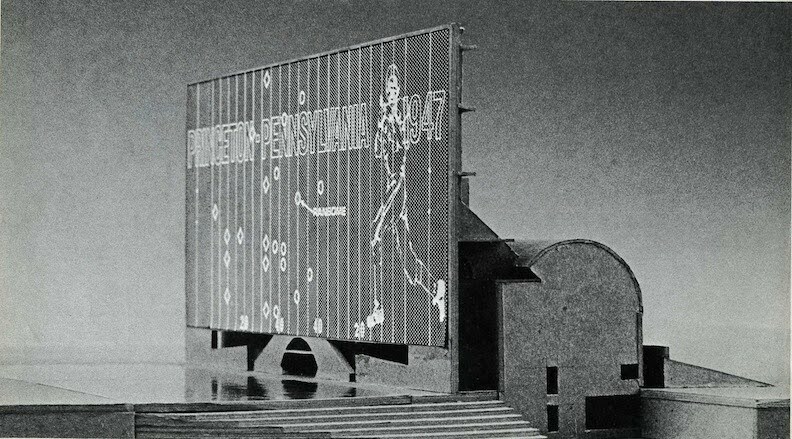 More specifically, however, the National College Football Hall of Fame is an important predecessor for urban screens not only because of its architectural qualities, but also for its use of a literal screen as a means to display a combination of images and data—a first stab at an architecture for the sake of impure opticality. More needs to be said about Weber's quote, and especially about the relevance of television screens to an examination of urban screens. If there is a building that truly exemplifies the relationship between television screen, curtain wall, and architecture, it would be the modernist apartment block from Jacques Tati's Playtime (1967). A medium shot captures the bottom two stories of a glazed building. Four large picture windows, roughly the same proportion as television screens, reveal four families watching television sets inside their apartments. Except for a few lamps, the television glow lights each unit from within. The effect of course being that each unit now resembles a television set. Here, spectator and spectacle, observer and observed are conflated onto the building's window wall: "the generic window-wall becomes a metaphor for the movie screen itself, its extruded architectural technology multiplying it ad infinitum." Top: Louis Sullivan, Carson, Pirie Scott and Co. Department Store (1899-1904); Bottom: Le Corbusier, Maison Clarté (1930-32) (Source: Sigfried Giedion, Space, Time and Architecture: The Growth of a New Tradition, Fifth Revised and Enlarged Edition [Cmabridge, Massachusetts: Harvard University Press, 2008 (1966)]). Jenney's Leiter Building vs. 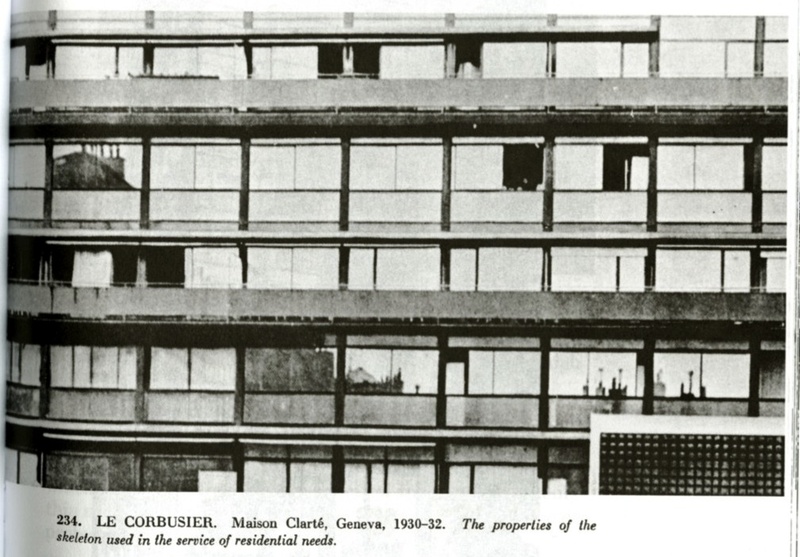 Le Corbusier's Maison Clarté, from Giedion, Raum, Zeit, Architektur: Die Entstehung einer neuen Tradition (Berlin: Springer, 2000 ). Tati's careful framing recalls similar photographs of building facades from Sigfried Giedion's Space, Time and Architecture (1941). In that book, Giedion looks to photographs of windows and skeletal frames of buildings such as William Le Baron Jenney's Fair Building (1891) and Leiter Building (1889), as well as Louis Sullivan's Carson, Pirie, Scott and Company department store (1899-1904) as buildings where "what is expressed in its construction and its architecture" are equal. The demarcator between the various structural/architectural elements are the horizontally-elongated "Chicago windows" that give these buildings their glazed appearance. 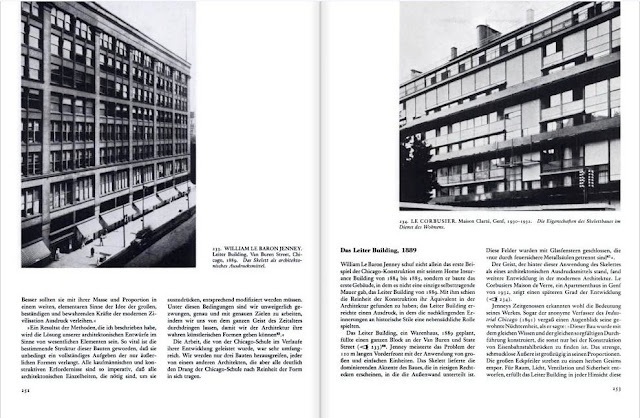 And in one famous instance, Giedion utilizes a Wölfflinian approach and pairs Jenney's Leiter building on one page against Le Corbusier's Maison Clarté (1930-32) on the other. Although Giedion uses these images to show how these two architects used skeletal frames to achieve a kind of architectural purity, again it is the difference in glazing that deserves attention. 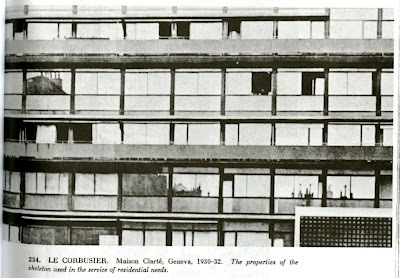 Whereas the windows are cut deeply into the Leiter building's facade, in the Maison Claré, window and structural unit seem to become part of the same surface. This too is a compositional trick. With careful cropping and the use of a telephoto lens, the terraces and walkways are flattened onto a single image. 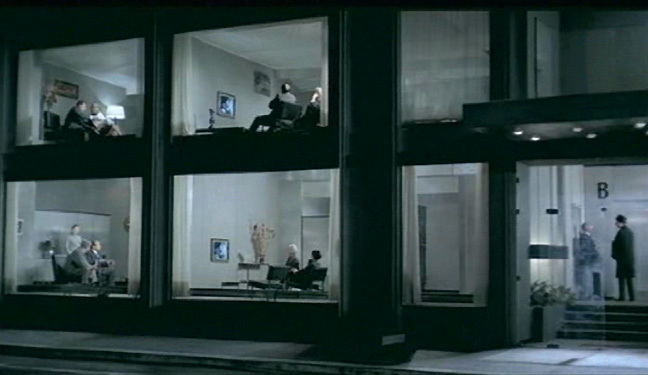 In Playtime, the apartment building also reveals a decided Chicago Frame influence. The dark, horizontal floor plates, when played against the lighted vertical framing, suggest that the windows are also cut deeply into the facade. And yet the ambient television glow from within problematizes this distinction. A second glance reveals that the glass planes are indeed flush with the surface facade. And as in Mies van der Rohe's Seagram Building (1957), external wide-flange vertical beams are deployed as subtle ornament. This collapsing of window onto facade becomes yet another way to erase any distinction between building and image. 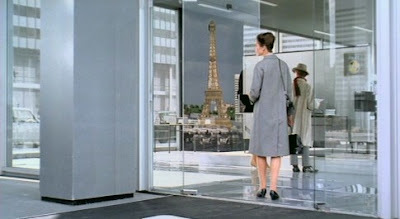 And this is even more so in Tati's film, where glazed curtain walls reflect other parts of Paris. Here, then, glass becomes architecture. Architecture becomes a screen that reflects images onto public space. In short, as demonstrated by the various buildings (and reflections of buildings) in Playtime, architecture has become a true urban screen. Let us return back to Weber's definition of "screen". Specifically, the second definition—that of a screen as a filtering device—becomes important because is alludes to how an urban screen may be deployed in front of a building. The urban screen becomes a site of impure opticality, a surface where various kinds of images, colors, and information, illuminate city spaces. And yet, once we move beyond Huhtamo's archaeological investigations, we note that urban screens filter and obscure much more than the supporting architecture: they conceal histories of architectures that gave rise to this phenomenon in the first place. Scott McQuire, Meredith Martin, and Sabine Niederer, Introduction to Urban Screens Reader (Amsterdam: Institute of Network Cultures, 2009), p. 10. Gianni Ranauldo, Light Architecture, New Edge City (Basel: Birkhäuser, 2001), p. 7. Erkki Huhtamo, "Messages on the Wall: An Archaeology of Public Media Displays" in Scott McQuire, Meredith Martin, and Sabine Niederer, Introduction to Urban Screens Reader (Amsterdam: Institute of Network Cultures, 2009), p. 15. Samuel Weber, "Television: Set and Screen," in Alan Cholodenko, ed. Mass Mediauras: Form, Technics, Media (Stanford: Stanford University Press, 1996), quoted in Reinhold Martin, "Atrocities. 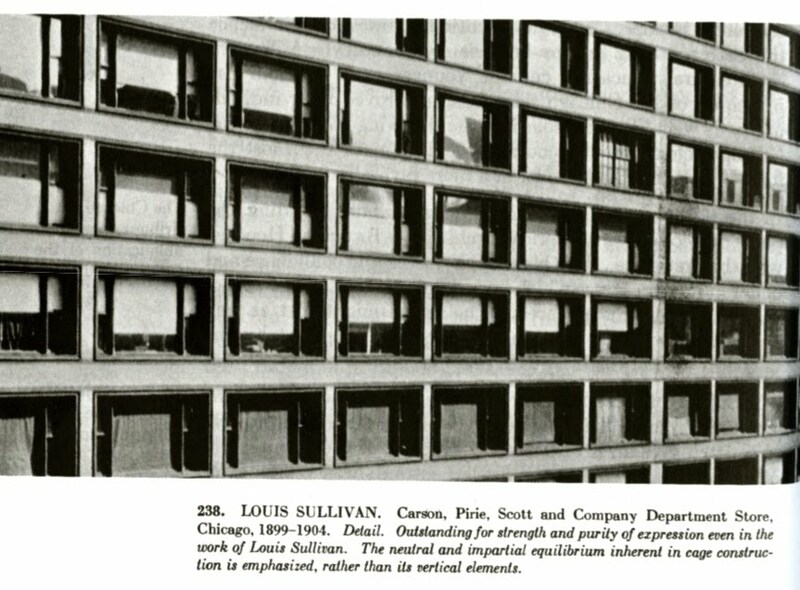 Or, Curtain Wall as Mass Medium" Perspecta, Vol. 32, Resurfacing Modernism (Cambridge, Massachusetts: MIT Press, 2001), p. 70. Unheimlich. Die Konturen der Häuser sind aus gewischt. Aber in Bewußtsein steigen sie noch, laufen einander nach, überennen sich. Das ist die Folie für die Flammenschriften, das Raketenfeuer der beweglichen Lichtreklame, auf- und untertauchend, verschwindend und ausbrechend über den Tausenden von Autos und dem Lustwirbel der Menschen. Noch ungeordnet, weil übersteigert, aber doch schon voll von phantastischer Schönheit, die einmal vollendet sein wird. Erich Mendelsohn, Amerika: Bilderbuch eines Architekten (Berlin: Rudolf Mosse Verlag, 1928), p. 130. For more information, see Enrique Ramirez, "Erich Mendelsohn at War" Perspecta, Vol. 41, Grand Tour (Cambridge, MIT Press, 2008). Ivar Lo-Johansson, The Author (1957), quoted in Dag Windman, Karin Winter, and Nina Stritzler-Levine, Bruno Mathsson: Architect and Designer (New Haven: Yale University Press, 2006), p. 14. Rober Venturi, Denise Scott Brown, and Steven Izenour, Learning from Las Vegas: The Forgotten Symbolism of Architectural Form (Cambridge: MIT Press, 1977 ), p. 6. Venturi, "A Bill-Ding Board Involving Movies, Relics and Space," Architectural Forum (Apr., 1968) pp. 74-76. Joan Ockman, "Architecture in a Mode of Distraction: Eight Takes on Jacques Tati's Playtime," in Mark Lamster, ed. Architecture and Film (New York: Princeton Architectural Press, 2000), p. 189. Sigfried Giedion, Space, Time and Architecture: The Growth of a New Tradition (Cambridge: Harvard University Press, 1967 ), p. 385.